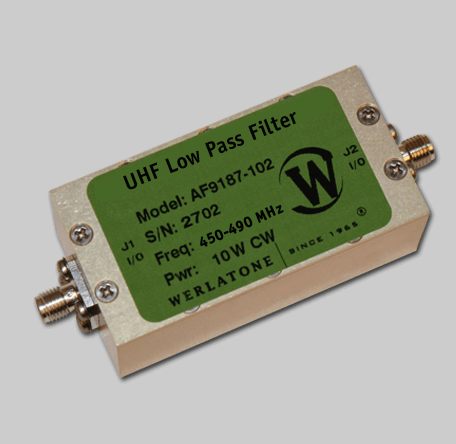 The Model AF9187 is a UHF, Low Pass Absorptive Filter, covering the 10-490 MHz bandwidth. This high power design is conservatively rated at 100 W CW (Pass Band), and 10 W CW (Stop Band). The Rejection is guaranteed at 45 dB minimum from 850 to 3000 MHz. This compact design measures just 2.5 x 1.265 x 1", and is ideal for military & commercial applications. The Model AF9187 is a UHF, Low Pass Absorptive Filter, covering the 10-490 MHz bandwidth. This high power design is conservatively rated at 100 W CW (Pass Band), and 10 W CW (Stop Band). The Rejection is guaranteed at 45 dB minimum from 850 to 3000 MHz. This compact design measures just 2.5 x 1.265 x 1″, and is ideal for military & commercial applications.